Prenatal and New-born Genetic Testing Market size was valued over USD 3.4 billion in 2017 and is expected to witness more than 11.9% CAGR from 2018 to 2024. Technological advancements and increasing benefits in the field of genetic testing for prenatal and neonatal births will change the screening and diagnostic practices with respect to genetic abnormalities of foetus. Emergence of new technologies such as non-invasive prenatal testing (NIPT) procedure will give rise to high demand for prenatal and new-born genetic testing practices resulting in boosting the market growth. Rising prevalence of genetic disorders and chromosomal abnormalities in the new-borns across the globe is becoming one of the leading cause of infant mortality. Increasing birth defects and infant mortality has escalated the demand for prenatal and new-born genetic testing. Rising consanguineous relations specifically in countries of Asia and Middle East regions will augment the market growth. The increasing number of births arising from consanguineous marriages are resulting in higher inbreeding offspring population that have a high risk of getting diagnosed with genetic disorders. Lack of advanced infrastructure and skilled labor in developing region will interfere with implementation of infant genetic testing, thereby impeding the market growth. Skilled healthcare professional and assistants are required for the propose of carrying advanced prenatal and new-born screening tests. Screening technology held majority of the market share with USD 2193.6 million and is anticipated to show robust growth with a CAGR of 11.8% in the forecast year. Rising number of pregnancies in women at later stage of life is leading to increasing risk of developing genetic disorders in new-borns. Growing awareness among the pregnant women regarding baby’s health and early detection of genetic disorders will boost the screening technology in the upcoming future. Diagnostic technology is estimated to show significant amount of growth in the forecast period. Accurate and specific diagnosis of the genetic disorders is necessary in order to begin appropriate therapy and line of treatment. Also, the rising rate of infant mortality due to birth defect has resulted in increasing demand for diagnostic technologies, that will eventually lead to growth of the market segment. Downs Syndrome holds around more than 50% market share of prenatal and new-born genetic testing market and will show a robust growth over the forthcoming years. Increasing in the number of population suffering from Downs syndrome will largely support the segment growth. Women pregnancies in the later years of life increase the risk of baby getting diagnosed with Downs syndrome. This further supports the segment growth over the forecast timeframe. Cystic fibrosis is anticipated to show lucrative growth in the forecast period. It is a very common autosomal recessive genetic disorder with high prevalence rate. Steady increase in the number of births diagnosed with cystic fibrosis and growing awareness about existing mutations of Cystic fibrosis will increase the rate of infant genetic testing market. Hospitals held largest market share due to increasing number of births across the globe. with maximum amount of deliveries taking place in the hospitals and provision of facilities in hospitals for the purpose of infant genetic testing. Hospitals has services that carry out neonatal screening immediately 48 hours after birth, that provides significant scope for the market growth. Diagnostic centres are estimated to show substantial growth rate over the upcoming years, attributed to improved awareness related to the personal health and genetics of the new-born. 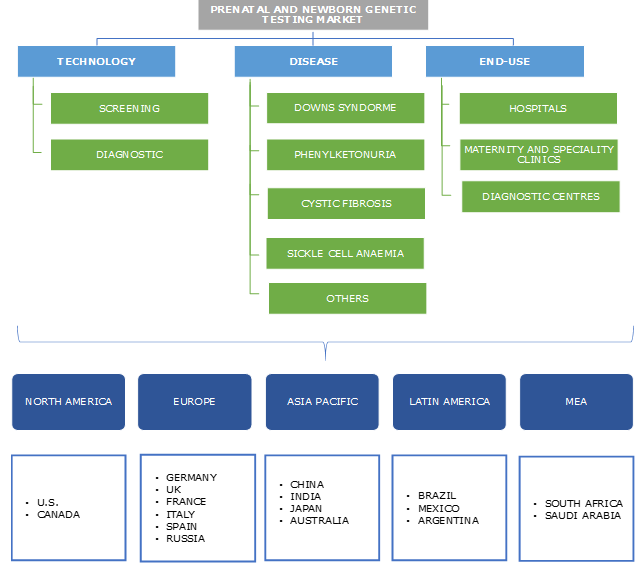 Research related to genetic disorder mapping provides diagnostic centres a wide scope for early detection of disorders leading to market growth. U.S. dominated the prenatal and new-born genetic testing market in the year 2017 with a market share of USD 2003.3 million, covering around more than fifty percent of the market share. Ongoing technological advancements leading to manufacturing of superior quality tests coupled with favorable reimbursement policies will enable U.S. to gain higher revenue share in the forecast period. High awareness about infant genetic testing and availability of sophisticated infrastructure required for carrying out prenatal and new-born genetic testing will drive the regional growth. Japan is forecasted to show robust growth rate with a CAGR of 15%, due to presence of government initiatives supporting screening activities that will impel market growth. Moreover, increase in the number of medical institutions and facilities providing prenatal and new-born genetic testing will expand the industry growth in forthcoming years. Some of the leading players include Ariosa Diagnostics (Roche), Berry Genomics, BGI, Biorad, Illumina, Laboratory Corporation of America, Natera, Qiagen, Sequenom, Trivitron Healthcare and Verinata health. The firms have implemented strategic decisions that include new product launches in the field of prenatal testing. New product launches and new product development in the field of non-invasive prenatal testing along with merger and acquisitions have helped the companies increase their capabilities and sustain in the market by providing better solutions to pharmaceutical industry. Increasing government initiatives for encouraging more prenatal and new-born genetic testing programs to be carried out in developing countries and rising global prevalence of genetic disorder among the new-borns are major factors that have supported the industry growth. Also, increasing number of births from consanguineous marriages are giving rise to inbreeding offspring that have relatively high chance of suffering from genetic disorders. Hence the following factors will have play major role in the growth of the prenatal and new-born genetic testing market.